← Most People I Know, think that I’m Cra-aa-aazy! My fellow Australians, don’t be alarmed, but Community TV has been chopped and now they’re coming for Aunty ABC! Make a loss, and you’re a drain on taxpayers and should be privatised. Make a profit, then you’re a federally subsidised monopoly which must be privatised. Question Government blunders and you’re a biased hotbed of socialism that needs to be privatised. Unfortunately, my children think that ABC stands for ‘Another Boring Comedy’, and really don’t care if bits of our national broadcaster start getting hacked off, but for me it would be like watching smirking bullies kicking the stuffing out of Big Ted. 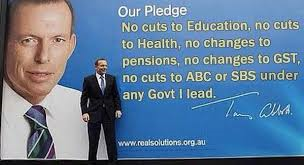 So last year I was very relieved when grinning Mr. Blue Tie stood next to a sign that looked like a huge Sesame Street prop, and carefully pointed out that there would be ‘No Cuts to the ABC!’ Sadly, one year later, Mr. Communication gravely announced funding cuts to the ABC. Apparently trimming Aunty’s cash flow will make her ‘leaner and more creative’. Possibly in much the same way that someone who has lost their job gets leaner and more creative with their dwindling supply of tinned food in the pantry. If she can only afford to serve up bland leftovers, then it won’t be long until we stop visiting Aunty altogether and she will be shuffled off to join the casts of Bellbird, Dads’ Army and Mr. Squiggle; no doubt to the delight of a Mr. R. Murdoch. Call me cynical, but there’s a sniff of political payback in cutting Aunty’s pension. Mind you, if that were true, I’m sure one of the ABC’s crack journo’s will soon uncover the sordid truth and… oh. This entry was posted in On a Lighter Note... and tagged ABC, Tony Abbott. Bookmark the permalink.